...but let's not talk about the downside of the season. A wonderful positive is the abundance of summer fruits for breakfast with Mr E! All those wonderfully bright colours offer a variety of vitamins and nutrients for our bodies. We're off to Townsville to look at two prospective rental houses today, and if we're successful we'll be using plenty of energy to pack up our house, load a moving van, and relocate. Those vitamins will sure come in handy! Mr E has already began to pack up his tools and yard equipment, but not alone. 11yo grandson Calab came by yesterday to give Pop a hand, and he was rewarded a dinner of his choice - spaghetti and egg on toast. How easy was that?! While they worked outside in the heat, I worked inside in the cool. A few patterns were written, some tidying of the sewing room, and then I cut all the pieces for my "Promises & Borders" quilt. If you're intending to make this quilt, I have the material requirements and cutting instructions for download on Tuesday's blog post. A great idea is to label zip lock bags with the sizes of the strips you've cut ready for the piecing. I'm going to buy a pretty box tomorrow to store all the pieces and completed blocks in. Having everything in one place keeps my mind organised - and I love an organised mind! A couple of commenters have said they are unable to download the block and pattern shared HERE. One lady asked if I could upload the files to google documents. Well, they are already on google, so not sure why you're having a problem. Wish I could help, but sometimes things just don't want to download as they should. Now to make lunch before we head off for the house inspections. Can I ask you to pray that we find the right house for us to rent this year, please? Let's hope you are all very happy, Sweet! Good luck with your house hunting and thank you for the block and pattern. So lovely! I love the new BOM. It is lovely. Prayers for you and your family that you will find just the right place to call your new home. 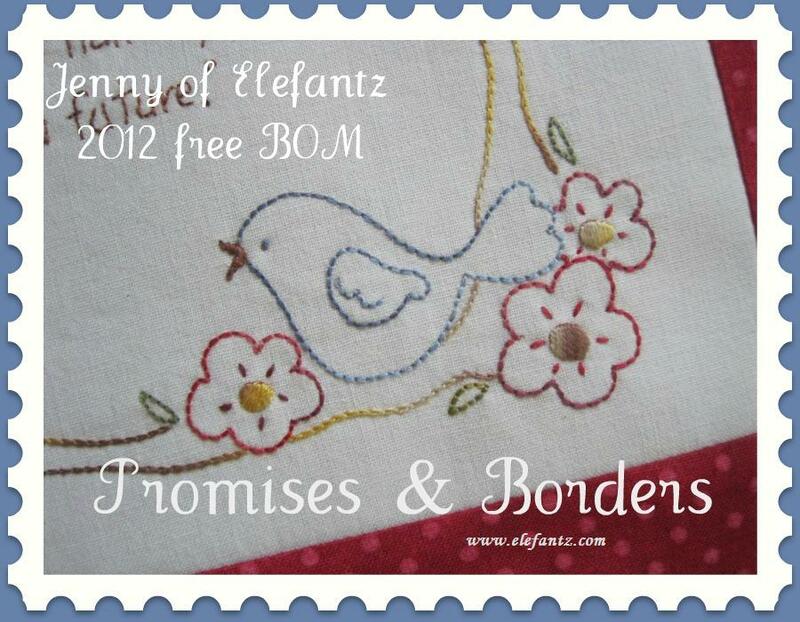 I am not a blogger but I will email my quilt group with the information about the new BOM. I will definitely keep your house hunting in my prayers! Blessings!! Hope you find a fabulous house Jenny. Has Mark got a new job already? How far is Townsville from where you are? Will it take long for the kids to come and visit. Good luck with finding a new place and with the move. Your new project promises to be wonderful. Oooo Sweety...that red fabric looks familiar!!!! hee hee.....must off and download the de-structions now...looking forward to this one! You've got a wonderful home darl, now the right house to fit all that love in is sure to be waiting for you! Praying that you find the right house today. Good luck with the move, dear friend. I like the zip lock bag idea. I sort of do it already. I just don't have enough on the go yet. Good luck with the house hunting. We certainly are spoilt with all the summer fruits. good luck with your house hunting I am sure their is just the right house out there for you and you will find it. You must be an expert at packing and moving Jenny!! Love the fabrics you are using for your BOM projects. Love the zip lock bag idea. The perfect house is out there for you and Mr. E. Prayers headed your way! Thanks for all the tips on keeping the cut pieces organized. Here's praying for the right house! I don't know how you do so much. You are one very busy woman! Praying for the right house right now. Jenny !! you are an amazing person , on the move again . I so wish I was there to help . I mustphone bluebell and tell her . She is very busy with the grandson at present and might miss this post . May you have strength in your search and happiness in all you do . Good Luck Jenny, I hope you find your house, have a safe journey. How lovely to have a willing helper! Hope you find the perfect house. Good luck with the house-hunt, Jenny--you've got my prayers, not to worry. We are doing the same, but there's not much pressure to move yet other than I can't wait to get into my forever home and out of this limbo. Thanks for the zip-bag tip. This will help immensely! I've scheduled my shopping trip this weekend. Can't wait. I am new to your blog but I absolutely love it! I was wondering if there is a way to purchase the past issues of your magazine. I would really like to make the Circle of Life quilt. I looked to see if you had the patterns for sale on your Etsy site but they weren't there either. I hope I can get them somehow. Thank you for the great free BOM. I will be doing that one for sure! Querida Jenny, están en mis oraciones y espero pronto encuentren la casa, gracias por siempre compratirnos de tus hermosas creaciones, siempre es un placer hacerlas. Un fuerte abrazo a la dsitancias. I have completed the first of your BOM Promises and Borders and thoroughly enjoyed stitching it:) Photo in my blog.